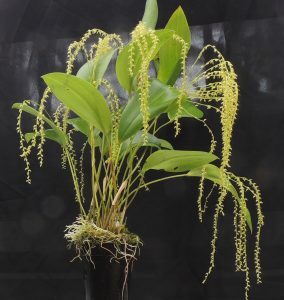 Many pleurothallis species are small plants or even tiny miniatures but some like this species are large dramatic plants with thousands of small flowers on a mature plant. This plant stands 60cm high and is still a relatively young plant. The flowers have been in bud (like tiny bird’s beaks) for a while and it does take a close inspection to see the fine thread like petals that show flowers have opened. 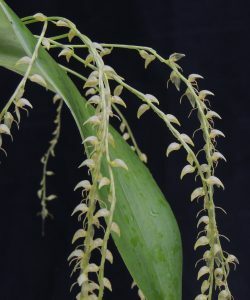 The flowers are not large but the long pendulous flower spikes are very attractive especially since individual leaves can produce up to ten flower spikes. Pleurothallis urceolata is native to Ecuador where it grows in cloud forests from 1500-2900m altitude and in common with many of the larger leaved pleurothallis it enjoys being kept wet and shaded especially in the summer when overheating can lead to dark blotches on the leaves.